We offer our patrons a range of Calcium Fulvate, which is a water soluble organic based product with fulvic chelated calcium (ca). It is the most powerful and effective natural chelating & complexing compound, changing metallic calcium into readily absorbable form. Once the calcium blends into the fulvic acid complex, it turns bioactive, bio-available & organic that allows fulvic chelated calcium rapid entry through plant walls. It is because of the high complexing ability and has low molecular size, our range rapidly absorbed by the leaf & root system, which guides to quick recovery of suffered plants. 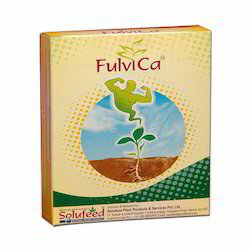 Fulvic is largely admired for preventing many physiological disorders of crops and vegetables. It is most effective organic fertilizer. Looking for Calcium Fulvate-Organic Fertilizer ?